Hello everybody! Textured Polish Week continues! 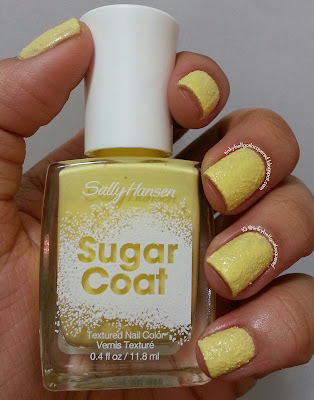 Today is Day 4 of TPW and I'm featuring four polishes from the Sally Hansen Sugar Fix first generation collection. Anyway, these polishes are similar to the Milani Texture polishes that I posted last Tuesday. The difference is that they are a bit less gritty than the Milani ones, and these are more "springtime" colors. Let's get right to the swatches! Leading the roster is Sugar Fix. Sugar Fix is a white polish that dries to a textured finish. It's like powdered sugar on your nails! Shown is three coats with no top coat. 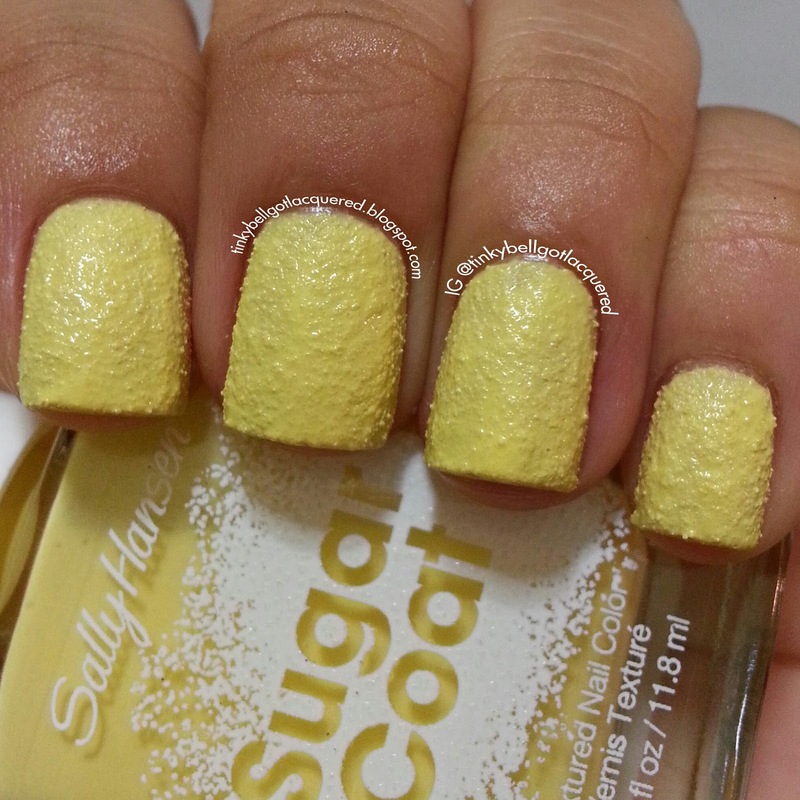 Sweetie is a soft buttery yellow polish that dries to a textured finish. I love yellow polishes so naturally I had to get this one. Shown is three coats with no top coat. And here is Sour Apple. 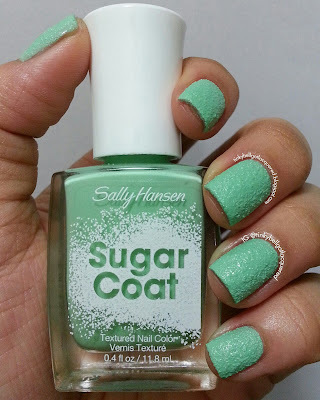 Sour Apple is a pastel mint green polish that dries to a textured finish. I honestly think they should have labeled this something else because when I hear or read "sour apple" I think of a different shade of green. Shown is three coats with no top coat. Last but not the least, here is Lick-O-Rich. Lick-O-Rich is a black polish that dries to a textured finish. Yeah black isn't really very "springtime" but I still like this color. And I'm guessing the name is a play on words but it just sounds... (reads?) weird. Haha. Shown is three coats with no top coat. I didn't try this with top coat because I felt like the results will be like the Milani ones. Thoughts? I liked the texture on these better than the Milani ones. These had a bit finer texture, and a wider range of colors. The only issue I have with these polishes is that it takes three coats to achieve this look, but it wasn't really a big deal because they dried fast. The first coat goes on good, but when I do the second coat, that's when I start having problems. That's why I have to do three coats to even it out. The formula was so-so. It does get thick after sometime but if you work fast enough, it won't be a big issue. Also, it doesn't dry as matte as I expected. It was just like regular creme polish that dried with a textured finish. Would I recommend these polishes? For the most part, yes. If you're a fan of the textured polish trend, these might be worth a go because I haven't seen these colors from other brands. Some aren't still on board with the textured polishes yet, but it's fun to step out of your comfort zone once in a while. :) The price might be a bit for some, at around $7 a bottle, depending on where you buy them. But some stores have deals and discounts once in a while so if you come across any, then it wouldn't be so much out of your pocket.